Over 200 species of Jasminum exist, according to the South African National Biodiversity Institute. Some are woody vines, while others are shrubs. Many are evergreen, and a few are deciduous. While jasmine may be best loved for its fragrance, some species of Jasminum don't have a scent. Still, these popular plants are excellent landscape plants. Home gardeners who want to enjoy their long-lasting beauty should take care to prevent, watch for and treat diseases common to jasmine plants. Rust is a fungal disease that can affect any part of the plant, including the stem, underside of the leaves, and even the flower buds. The fruiting bodies of the fungus are a bright orange or red color, making this disease easily recognizable. As it progresses, rust will disfigure newly emerging leaves and flowers. Leaf blight is caused by a fungal disease that affects the foliage of jasmine plants. Usually, an infection is indicated by brown spots appearing on the leaves. Leaves may curl up, dry up or even fall off. In some cases, the fungus can spread to new buds, causing them to turn brown, shrivel up or drop off before opening. Root rot can affect almost any shrub or vine that has been planted in an area of soil where standing water collects, or is watered too frequently. This fungal disease thrives in waterlogged soil and attacks the roots of the plant, causing it to be unable to absorb nutrients. As a result, the plant slowly wilts. Most die from the crown and outer branches inward. Uprooted jasmine plants will show black, dead patches on the roots. This disease is difficult to eradicate, and the plant usually cannot be saved once infected. To prevent rust and other fungal diseases from occurring, be sure to allow plenty of room for air to circulate around your jasmine plant. This will help it dry more quickly after rainstorms and watering practices, as many fungi are spread on water. Watering from above can also contribute to leaf spot and rust, as this practice allows water to sit on the leaves for an extended period of time. Water at the soil level when possible. Do not allow infected leaves or buds that fall from the plant to sit on the ground, as the fungus may overwinter in the soil. Prevent root rot disease from occurring in the first place by planting your jasmine in well-draining soil and avoiding over-watering. Prune off the vines or branches that are affected if the diseases is contained to one part of the plant. 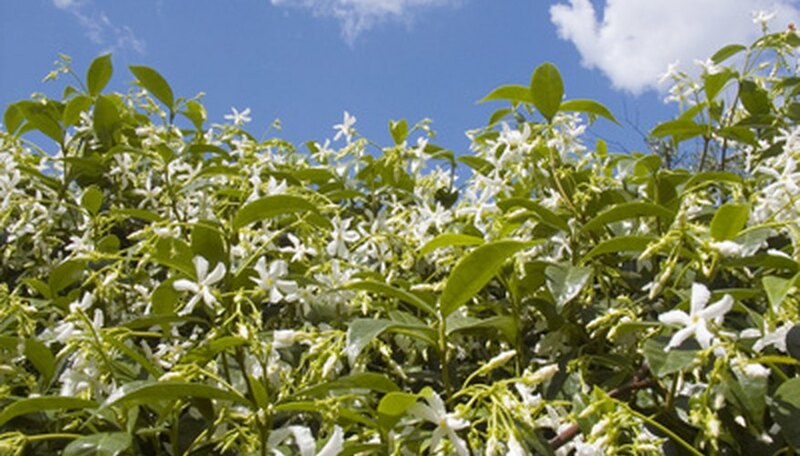 If it is widespread, treat the jasmine with a fungicide containing copper or sulfur. Follow the directions for application on the label according to the size and age of your Jasminum. If your plant is suffering from root rot, then drenching the soil with a bordeaux mixture (a mixture of lime and copper sulfate) can kill the fungi in the soil. One of the best ways to avoid jasmine plant diseases is to plant species of Jasminum that are hardy and known to be resistant to fungi. Common jasmine, or J. officinale, is relatively problem-free, according to Clemson University, and has very fragrant, showy flowers. Winter jasmine (J. nudiflorum) actually grows as a ground cover and can tolerate wet soil better than most other types of jasmine. The stems root when they make contact with the soil.